If you are an affiliate marketer promoting online marketing training and software, the strategies in this guide will help you to beat the competition and skyrocket your affiliate marketing sales. Let´s face it – affiliate marketing is hard these days! It seems like everybody is trying to promote the same products to the same crowd! If you check your inbox, you´ll see tons of affiliates promoting the same products. However, if you choose to buy, only ONE of them will actually make money! So, how do you compete? What can you do to outcompete them and BE THE ONE that is getting the sale, instead of struggling each and every day not making money from your affiliate efforts? When you check your inbox with all the emails from all the affiliates out there promoting some product, and you check out the product, you like the product, and you know that there are so many affiliates promoting it, how are YOU making the decision about who to buy it from? If you´re like me, chances are you´re CHECKING OUT THE BONUSES! You´re checking out what each of those affiliates is offering as an additional bonus to the product, and, if there is something you really like, you´ll buy from him, right? Well, even if that´s not you – trust me on this: a LOT of folks are doing it that way; they check what bonuses each affiliate is offering, pick what they like most and buy from him. 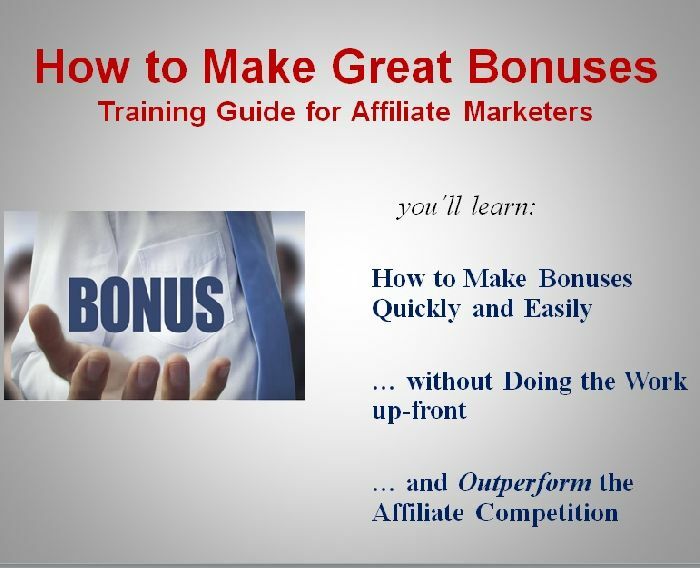 That´s why having great bonuses to offer increases your sales dramatically when you´re an affiliate marketer! But that means that in order for YOU to be the affiliate making all the sales, YOU have to be the one with the most awesome bonuses! To make that happen, I´v put together the guide on "How to Create Killer Bonuses"
you´re also going to get the right to SELL it or GIVE it away! If you want to build your list and need a great opt-in “bribe”: take this report and give it in exchange for their email! Or you want to make some quick money? Just SELL it! Or you are promoting something and would like to offer a killer bonus? Now you HAVE ONE! As long as you don´t modify the content, don´t claim ownership and don´t change the links – give it away, build your list, sell it! Test this product and everything that comes with it for full 30 days, and if, for whatever reason (or for no reason at all) you don´t like it, just let me know and I´ll give you a 100% refund - immediately, no questions asked and no strings attached!